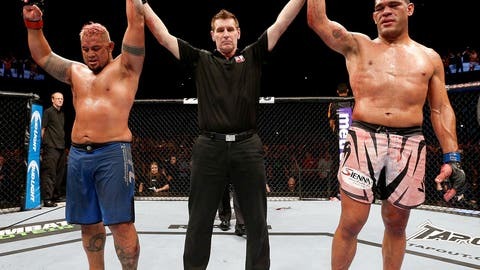 Mark Hunt vs. Antonio 'Bigfoot' Silva was 'The Draw' heard 'round the world. If you wanted to be a stickler for detail, you might try to make a case that someone was robbed in the UFC Fight Night: Hunt vs. Bigfoot main event. After 25 minutes of action, it almost seems cruel that neither man could walk away saying that he was better that night. But it would have been crueler if either had walked away feeling as though he lost. In the end, a draw just felt right, and how often can you say that? Every sport hates ties, but in this one, draws are almost universally detested. In fact, their announcement is normally met with roaring waves of boos. Not Saturday afternoon in Australia. The crowd, pro-Mark Hunt as they were, could not bring themselves to jeer his opponent Antonio ‘Bigfoot’ Silva, or the decision, or the judges. In many ways, the imperfect ending was perfect. Looking deeper into it, the fight was not especially easy to score. Bouts often have sustained periods of action in one fighter’s favor, where they take the momentum and run with it. Not this one. They might as well have fought it on a see-saw, because it was impossible to stay on top for long. Around the fight media world, opinions were mixed. FOXSports.com scored it for Silva 47-46. MMAFighting.com had it for Hunt 48-47. MMAJunkie.com had it for Silva 48-47. MMAMania.com had it for Hunt 48-47. Sherdog.com’s three scorers had it once for Silva and twice as a draw. In other words, there was no real consensus. The rounds that most agreed upon were three (to Hunt) and four (to Silva). But some people gave 10-8s to one and not the other. As it turned out for official scoring, the important round was the fifth, which judges Kon Papaioannou and Barry Foley both scored 10-8 for Hunt. There is something to debate there, if you want to. Virtually nobody else scored the fifth 10-8 for Hunt. FOX Sports didn’t. MMA Fighting didn’t. Neither did Junkie or Mania, although one of Sherdog’s scorers did. There is certainly an argument to be made that Hunt didn’t do enough to warrant that lopsided round score. It’s just that right now, no one wants to make it. It’s just not worth the effort. It just wouldn’t seem fair. Prior to the fight, if you would have said the match between the two behemoths would go five rounds, the prospect would have been met with groans. Generally speaking, weight classes and stamina are inversely proportional. Given that Silva (264 pounds) and Hunt (262 pounds) are on the higher end of the heavyweight limit and both cut weight to make the cutoff, the guess was that minutes 15-25 could get real ugly. After all, Hunt is 39 years old and had never before had to prepare for a five-round fight, while Silva hasn’t had to go past the first in 16 of his 24 pro fights. Instead, what we got was incredible work rate. Both fighters managed volume that rivals the output of flyweights. Hunt landed 184 of 262 strikes while Silva managed 137 of 235. For comparison’s sake, compare that to the first fight between flyweight stars Demetrious Johnson and Joseph Benavidez. In that one, Johnson went 96 for 177 while Benavidez was 53-259. But the most impressive thing was that the duo saved their best for the ‘championship’ rounds, when they were already hurt and exhausted. With an injured leg and possibly broken hand, Hunt threw more than half his total strikes in just the last two frames. With his face bloodied and bruised, Silva threw an incredible 151 strikes over the last 10 minutes. And these weren’t jabs they were throwing. This was straight heat, meant to finish. Here it must be said that the 11,393 fans in the Brisbane Entertainment Centre helped bring the rollicking fight to the finish. Each time Hunt was in trouble, they rallied to his side and seemed to help pull him out of the darkness. By the end, it was if they were doing the same for both. The truth is this: when you do this for a living, there are some events that you’re not quite as excited to attend. It could be for many reasons. The travel, the fight card, something you don’t want to miss back home. This was one of those cards. Nothing against Australia, but it is far. Almost 24-hour travel time plus the prospect of crazy jet lag is not a wonderful attraction, at least not for me. Not with a soon-to-be two-year-old daughter I can’t stand leaving. But when the assignment comes, you pack your bags and hope that it ends up being worth your while. In that sense, Hunt-Silva was the happiest accident of my career. Going in, it was hard to expect too much. There was nothing of real substance at stake. Neither was sniffing a title shot, or even nearing top contender status. At most, it seemed, we could hope for some highlight-reel finish. That would have been good. What we got instead was great. The highlight reel was the whole fight. Those of us on press row are not allowed to cheer. It is considered unprofessional. At the conclusion, some did anyway, and no one could really blame them. The least you can ask of athletes is an honest effort. But these two? With nothing tangible at stake, they fought as if everything was on the line. Then when it was over, they were left in the same place where they began. No better, no worse, at least in terms of record. They were tied, and everybody cheered, and somehow, it was all perfect.